William Joseph Dodd, known as Bill Dodd (November 25, 1909 – November 16, 1991), was an attorney who held five significant positions in his adopted state of Louisiana between 1940 and 1972. His political career began as a Democratic state representative and then as a one-term lieutenant governor under Earl Long, with whom he had a love-hate relationship over the years. From 1956 to 1960, he was the state auditor, an office no longer elected. He was the president and a member of the Louisiana Board of Education from 1960 to 1964, when he began the first of his two terms as the state education superintendent. Yet he never was governor, a position which he unsuccessfully sought in 1952 and again in 1959. He never let the disappointment affect his optimistic spirit or his patriotism. Dodd was born in Liberty in southeastern Texas but came to Louisiana as a child so that his father could work in the logging industry. He graduated from Northwestern State University in Natchitoches and the Louisiana State University Law Center in the capital city of Baton Rouge. After teaching in Allen Parish, he was elected to the legislature in 1940 but took time off for United States Army service in World War II. In 1948, he was elected lieutenant governor but grew estranged from his mentor, Earl Long. He lost out to fellow Democrat Robert F. Kennon in the gubernatorial race in 1952 and failed again in 1959, when Jimmie Davis won his second non-consecutive term as governor. In the meantime, he was state auditor for a term and education superintendent for two terms until he was unseated in 1971 in the party primary by Louis Joseph Michot, Jr. (1922-2012), a wealthy businessman from Lafayette. Dodd failed in a comeback bid for education superintendent in the first ever nonpartisan blanket primary in Louisiana held on November 1, 1975. 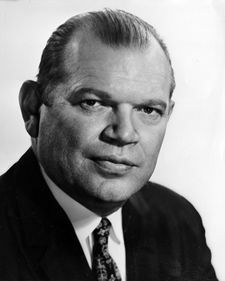 Dodd was reconciled with Earl Long and campaigned for the ex-governor in the 1960 congressional primary. Long won the Democratic nomination, then through a closed primary, but died thereafter. Then the losing candidate to Long, Harold Barnett McSween (1926-2002), a banker from Alexandria, was named the nominee and won the 1960 general election, when John F. Kennedy defeated Richard Nixon for Louisiana's then ten electoral votes. The congressional seat, the 8th district, no longer exists. Prior to 1958, it was held by one of Long's brothers, George Long, who died in office. Shortly before his death, Claitors Publishing in Baton Rouge released Dodd's lengthy memoir, Peapatch Politics: The Earl Long Era in Louisiana Politics. Dodd, a Southern Baptist, is interred at Greenoaks Memorial Park in Baton Rouge. This page was last modified on 18 April 2018, at 11:16.